The most important reason for purchasing this comforter set was because it went with the green theme in my room. I had previously bought an orange comforter set from this brand for another room in my house and it looked great. While the green in the photo is a little darker than in real life, it still works well for my theme. I'm usually a VERY picky buyer, but I will keep this set because it is the best I have come across so far in regard to green options. Update your bedroom decor with this eight-piece comforter set. The set includes everything you need to transform your bed: a reversible comforter, two shams, two euro shams, one breakfast pillow, one square pillow and one bedskirt. Set includes: One (1) comforter, Two (2) shams, two euro shams, One (1) breakfast pillow, One (1) square pillow, One (1) bedskirt. First, after I purchased this item, I did notice it looked very similar to a product on *******, ******** ******** *****. This is in fact what was shipped out to me. It is not reversible, and the colors, while they did come as green and brown, have a lot less brown on the comforter and a lot more green. 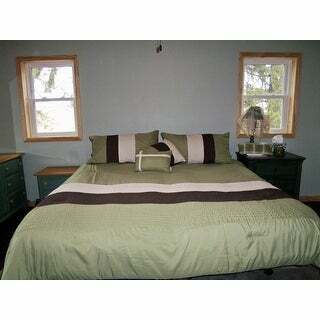 Even the picture on ******** is not accurate to the layering of the browns and greens on the comforter. Also it is not reversible. I did ask a question on the bottom of this page about that since another reviewer stated it was not reversible when the description states it is. My question below was answered, by I'm assuming someone from this website, stating that the description is accurate. Technically I could flip the comforter over, but it will just be solid green and not the vine like pattern shown in the picture. I might keep the item, but had not planned on as much green as it actually came. I'm not happy about it but might be able to make it work. I think it was perfect. I bought the "Red" one. This has been my color scheme for the past few years and its hard to find new bedding with that color scheme. I also found that the comforter was true to size, because sometimes king sized spreads come in a little small. I am absolutely loving my comforter set. This is such a pretty set. The material is nice and soft and dresses not only the bed but the room nicely. Just bought a brand new bedroom set and this goes beautiful with it! The comforter fits perfectly on out Ashley Palisades Memory 12" foam Queen Mattress! Items we not as "wrinkly" as i thought they would be..everything was nicely folded..a few little lose strings here and there..but other than that BEAUTIFUL!! VERY HAPPY!! The nights and mornings are very cold, I really don't know it until I get out of bed. Love the comforter. You get what you pay for with this product. I will say that the colors (green and Brown) are exactly what you see online - love the design and colors. I was expecting a nicer comforter. I would be shocked if it lasts through 2 or 3 washes. I would suggest paying more money for a better quality comforter. Love the colors. Works well but I've had better quality comforters. I really like the quality of the fabric. I'm always a little nervous buying bedding without seeing it first because I have cats. I worry about snags if the cats just walk on it. This fabric does not snag when my cats are on it and I love the color. Great set. Colors are a perfect match in the master bedroom. Very classy and goes great with the new bedroom furniture. Classic look that will go with most decor. I gave this to my son who is hard on everything and it is holding up very well. This material is poor quality; I think is not worth the price. "Is the product truly reversible? A recent review below stated it was not actually reversible and that the lighter side does not actually have the floral patter. Is there actually a floral pattern on the reverse side? This set is extremely similar to a set on wayfair, "Victoria classics Essex" just a different name, and that set states it is not reversible and has a brown back side. I ordered the green and was just curious about what I'm actually getting"
Hello dav3030, please see the fourth photo for an example of the backside of the green floral pattern. Thank you for shopping with us. "I really loved the red one but unfortunately it is out of stock. is there is a way to get that color??" Hello noor999, unfortunately this item is out of stock and cannot guarantee the item will be restocked. Thank you for shopping with us. "On the red comforter, what is the other color? Brown? Gray? Black? I can't tell from the photo." Hello, dovelie16. Hope your day is going well. The other color is a rich chocolate-brown. However, unfortunately, this item is currently out of stock. Items are restocked as they become available but we cannot predict when or guarantee an item will be restocked. Please feel free to check back with us periodically to see if the item has returned. Thank you for shopping with us and contact us again with any further questions. "It's always hard to tell the true shade in a picture. How bright is the red? I am looking for a darker wine colored red." Hello woodk820, we are seeing a claret red. Thank you for shopping with us.